Thanks to the optimized design, the four grippers are attached to a support frame with integrated pneumatic ducts. Integrated functions: when compressed air flows into a flexible membrane the claws of the gripper will open. The hand is one of the defining stepping stones of human evolution: with its thumb opposing the other fingers, the human hand is an ideal tool for gripping, exploring, and working. As such, it is the key to cultural activity and technical progress. Industry often exploits this ingenious principle: one of the processes for which machines are used is the automated gripping of almost any desired part for transporting to the next operational step. Such gripping machines are masterpieces of engineering. Kuhn-Stoff GmbH & Co KG has dedicated itself to specialized engineering through the application of EOS Additive Manufacturing technology. The process entails the formation of machine parts, layer by layer, from plastic powder that is melted with a laser beam. In this way, Kuhn-Stoff has developed and produced an extremely lightweight, strong, and durable bronchial gripper for Wittmann Robot Systeme GmbH, in Nuremberg, Germany. Four of these grippers sit on a support frame with integrated pneumatic ducts. The customer is a manufacturer of robots and automation systems. Kuhn-Stoff was asked to re-design a mechanical gripper that raises, transports, and then sets down machine parts from a production machine via a pneumatic mechanism. The following requirements were established: the gripper should be lighter than its predecessor, while still being capable of moving the required loads. The complexity of the design should be simplified and the part must be able to satisfy efficiency criteria. The significance of the weight comes down to physics: grip systems such as this must work quickly in order to move as many machine parts as possible within a given unit of time. The fact that mass is inert means that force must be applied to set it in motion - the heavier a load is, and the faster it moves, the greater the forces necessary for both acceleration and deceleration. Quite apart from the viewpoint of energy efficiency, this fact also has particularly negative consequences on the durability of the system: the greater the forces in play, the higher the wear on the machine. 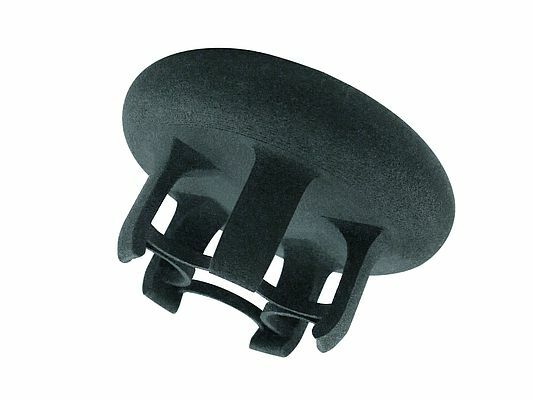 The previous version of the gripper was made from aluminum, rubber tubes, and multiple connecting elements, and was expensive to produce. The layer manufacturing experts from Kuhn-Stoff set themselves the goal of significantly simplifying the design. The new structure of the machine part should contribute to a portion of the weight reduction. 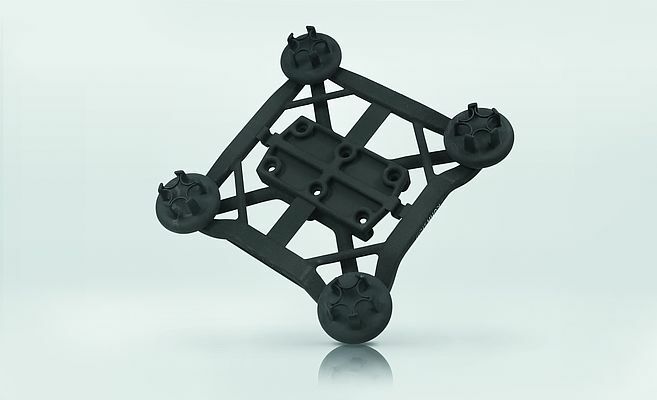 Another portion should be arrived at through structural optimization of the remaining parts - one of the central advantages of Additive Manufacturing. As work began it soon became clear that the new gripper could be produced as a single piece, without the need for post-production finishing or further assembly. The team from Kuhn-Stoff began by examining the functionality and working requirements of the gripper: when compressed air flows into a flexible membrane, the claws of the gripper will open; likewise the system closes when the compressed air is turned off. In addition to the plastic's flexibility, the part should be able to swivel through 90° to carry out the necessary motion sequence. Taking these requirements into consideration, it was possible to reduce the necessary number of parts to just two components. With the completion of the design process, Kuhn-Stoff began work on the production of the new grip system using a FORMIGA P 100. In just a few hours the two components of the grip system were produced from polyamide. Thanks to EOS technology the pneumatic ducts and connectors were fully integrated in the base plate. "As usual, production using the EOS system was smooth and problem-free. The end result, once again, impressed all those involved. In a single process step we were able to create a functionally integrated part that exceeded all of the requirements of the client. In short: Additive Manufacturing is now an everyday reality, but the results are still extraordinary," says Hannes Kuhn, CEO at Kuhn-Stoff GmbH. In terms of the major goal of weight reduction, Kuhn-Stoff achieved an 86% drop to just 220 g. Despite its light weight, the gripper is still able to carry the necessary loads, even in demanding, continual usage: after 5 million cycles the team halted the stress-testing, having reached the designated service life. Over this period, not a single defect or failure occurred. The reason for this is the strength of the construction, which was achieved despite the air ducts integrated in the base plate. In addition, the flexible design ensures that, should small collisions occur, these do not result in any damage to the gripper system or the injection moulding tool. In some cases, the lighter weight also enables the use of a smaller robot type leading to significant cost reductions. In addition Wittmann have been able to increase the number of working cycles due to the low height of the gripper which reduces the necessary opening width of the injectionmoulding machine's clamping platen. The bottom line is a reduction in operating costs. Manufacturing costs have been reduced by 50% compared with the conventionally manufactured predecessor. This is due to weight savings as well as the reduction of the number of components from 21 to two. Equally important is the short production time: the grip system, which previously took Kuhn-Stoff twelve days to manufacture, now requires just three. "We are extremely happy with the new grip system. It has proved itself to be just as effective in heavy-duty, continual use as the previous unit, yet is cheaper and lighter and can be produced more quickly. I have never seen as significant an advance in grip manufacturing as that which Additive Manufacturing has brought to the production of our bronchial gripper. The production method has had a very positive effect on our automation solutions," summarizes Michael Tolz, Head of Technology and Branch Manager at Wittmann Robot Systeme GmbH.